Nestled between two large, what looks like lime volcanic rocks, sits a tiny, but neat little church. A huge sign that stretches across the front entrance, 'The Father's House Campus Centre' was a welcome gesture to invited guests like us. There was another sign that read, 'Advancing the Kingdom with Hope and Purpose.' At first glance at the signs and the building, one can't help but wonder if this is the neighborhood hangout spot for teenagers. The entrance to the building was open, allowing the sound of kids's laughter from inside and the sweet meldoies echoing right out towards us as we slowly make our way in to find a room full of very attentive young girls and boys all seated on the tile floor. No heads turned, but only wide eyed and ears completely locked to the voice of a tall, dark bearded man that looks slightly younger for his age. His voice echoed across the small auditorium space within the four corners of the church building. Behind him was the main stage and seated beside us were three adults which presumably were camp assistants. All three men nodded and smiled at us as to say hello and welcome. They intuitively knew what to do as soon as they saw us because all three men got up and offered us each a chair by which we politely declined the offer. We would rather do criss cross applesauce sitting style just like the kids on the cool tile floor. The tall, dark bearded man was Pastor Obed Sandie. 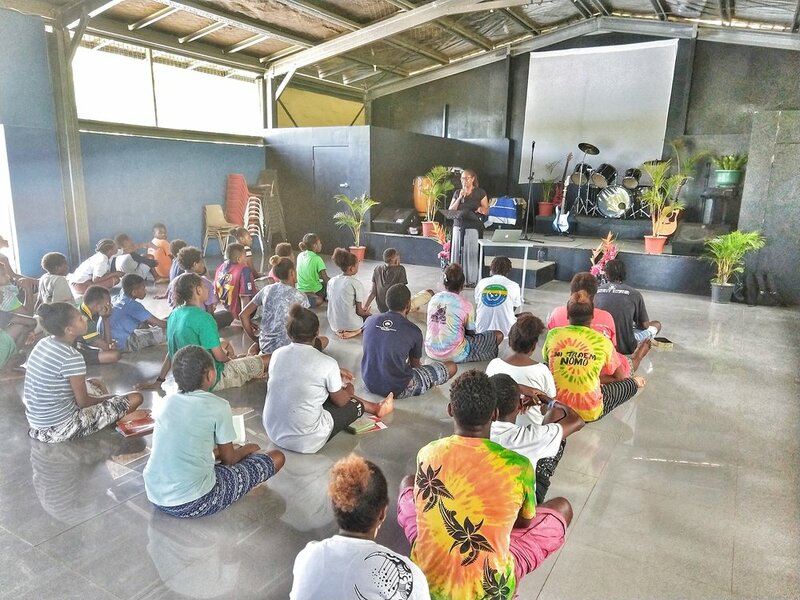 He heads the congregation at the Father's House Campus Centre and was in the middle of his talk about Hope - a topic he later explained is essential for the youth to hear who have gathered at the campus from 4 different Islands in Vanuatu for a week long Youth Camp. The majority of these youth were of secondary school age kids who have just travelled a long way to the capital of Vanuatu, Port Vila, for days on end on passenger ships coming from 4 different locations throughout Vanuatu. The focus of the Youth Camp is to elevate, encourage, and empower with an emphasis on finding your tribe. The first session ended with a total of 57 young girls and boys, ages 6-17 years-old being able to identify their tribes and getting accustomed with each other, although for some, it took a while to warm up to each other. We were immidately drawn to how attentive and well behaved they were and hanging on to every encouraging word they could get. As the guest speaker, Dr. Mere T. Sovick, founder and director of Melanesian Women Today, was asked to speak about her life story and how she earned a doctorate degree. Dr. Sovick narrated her life story, an infant growing up in the small village of Lavatu on the northern island of Pentecost to the capital city of Vanuatu, Port Vila, to a boarding school in New Zealand, on a Maori Marae, her work as a journalist, Peace Corps Vanuatu language trainer and U.S. student, have lead her to become the first Ni-Vanuatu woman and citizen to hold a doctorate degree from an American University and first of a handful of Ni-Vanuatu women with doctorate degrees. Leaning in - the power of a story.